Pack Your Passport, Baby: The Louvre with a 3 year old? You bet! 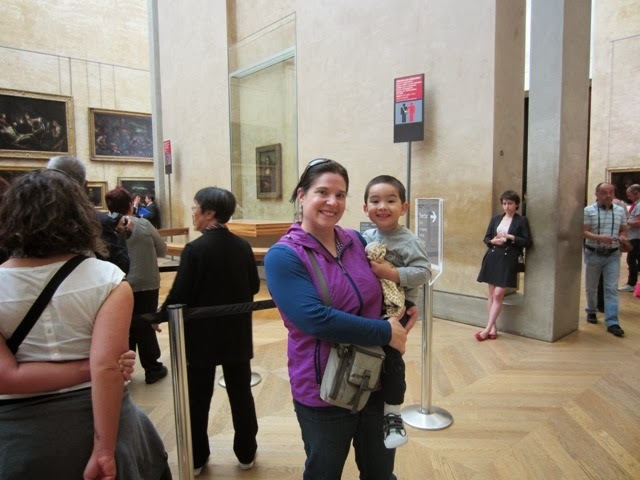 The Louvre with a 3 year old? You bet! The Louvre with a pre-schooler? Are we nuts? Admittedly, I was a bit leary about taking B to the Louvre, wondering if he would be bored and unruly. As it turns out, we all had a great time. We didn't try to see everything. We researched our visit in advance and selected a few 'must sees' to search out. We read a lot about Paris before visiting, particularly "This is Paris" by Miroslav Vasek. B had seen the Mona Lisa dozens of times in his book, and he was over the moon about seeing her in person. We used a compact stroller and had reasonable expectations of 'accessibility'. During our visit, we encountered lots of stairs, the occasional inoperable elevator and obviously large crowds. Having a compact stroller made things a lot easier when B got tired of walking, though we did have to pull him out of it a number of times to navigate stairs. We brought our own drinks and snacks. While you can't eat or drink in the galleries, there is seating near the gallery entrances and the foyer under the pyramid where you can relax and take a break. Snacks and drinks are available on site but they are VERY expensive. We kept our visit short and sweet - about two hours, then headed to the Tuileries Garden for a picnic and a good run.